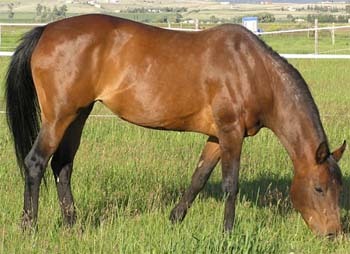 Horses show a huge variety of coat colours and unique markings. 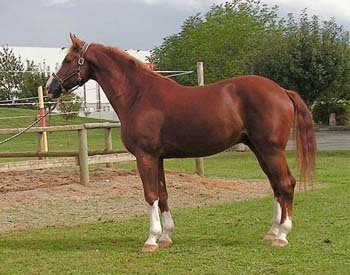 A horse's colour is often noticed before even its breed or gender. This is the first of a three-article series on equine coat colour designed to help you get to know the colours, the terminology and even the the reasons for all the beautiful shades horses and ponies come in. A horse's overall colour is derived from the colour of its skin and its hair, which in turn are decided by genetic factors. This first article introduces the three basic coat colours. Bay horses range from light reddish-brown to very dark-brown, with black points (that is: mane, tail, ear edges and lower legs). Bay horses have dark skin, except under white markings, where the skin is pink. Chestnut horses are a reddish brown colour with no black - the points are the same or lighter shade as the rest of the body. The word brown usually refers to dark bays, despite the fact that both bay and chestnut groups are called brown by casual observers. It is, however, easy to tell the difference by looking for the presence of black points. In fact, brown is actually another colour type entiely, but more on that in the next article. Grey horses vary from white to dark grey in colour. A grey horse has black skin with predominantly white or grey hairs. Greys can be born any colour and grey (in the same way as an older human), until almost their hair is almost white. 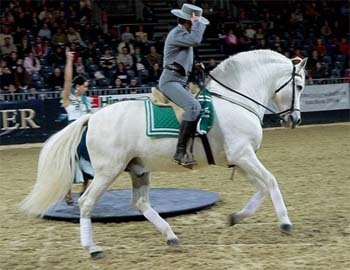 Most horses described as white are actually greys with a fully white coat. The difference is greys still have dark skin, which can be seen in areas of low hair such as the eyes and muzzle. Rose or iron greys are horses that are in the process of 'greying' from a darker colour. Dapples are patches of lighter hair on a darker grey horse. Fleabitten greys have little red flecks amongst lighter hair. Bay, chestnut and grey are statistically the most common colours. The next article in the series will present some of the less common colour types.